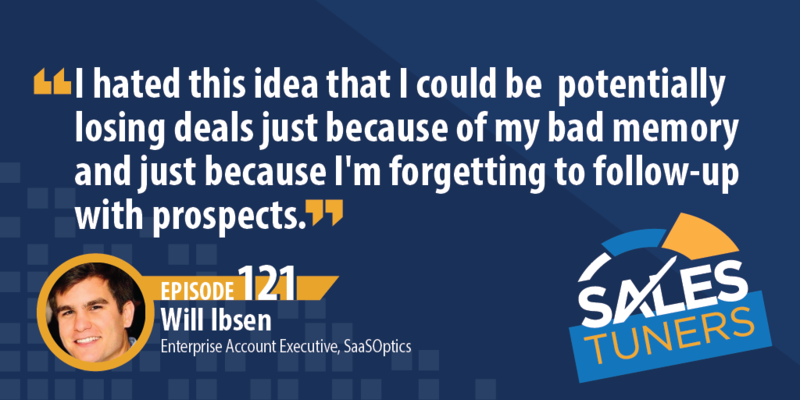 Will Ibsen is an Enterprise Account Executive at SaaSOptics, a platform that works with finance teams and CEOs to cut down “spreadsheet-time” by automating revenue processes and creating a single “source of truth” for all revenue metrics. Will grew up with a salesman father who worked “sitting in his office listening to rock music in his boxers.” As you can imagine, this salesman lifestyle was rather appealing to young Will. So, after a three-year stint working as a process engineer for Mercedes Benz, he decided corporate life wasn’t for him, took a sales job with a new startup, and the rest is history. Fortunately, his engineer training did not go to waste. In fact, it’s helped him rise the ranks and become a two-time top-selling account executive. Listen in to learn how you can apply his “engineer’s mindset” to optimize your sales process and boost your performance. Systematize Your Follow-up: I’m sure you’ve heard the phrase “persistence pays” many times. Well, I hope they were talking about sales, because it couldn’t be more true. I’ve read startling stats that say on average, a sales rep will only reach out to a prospect two times before giving up. That just seems ludicrous to me. Even if your company doesn’t invest in software for you and regardless of whether they’re an active opportunity, a warm lead, or a brand new cold prospect—find a way to build a process around your follow-up. After every touch you have, immediately schedule the next touch. If you use Salesforce, Hubsport, or even PipeDrive, you can run a report to show you any contacts that don’t have a next activity associated with them. Don’t lose deals because you simply didn’t follow up. Understand the Emotion Associated with the Problem: Will asked the great question, “How can I be empathic, when I never even get emotion from a prospect?” In order to be able to either elicit an emotional response from a prospect or pick up on their pain, you have to fully understand the emotion that typically surrounds a problem they’re trying to solve. You may hear them say they spend 15 hours looking at a spreadsheet, and yes, knowing that’s a trigger, it’s your responsibility NOT to just get the point, but dig deeper. Don’t ask them what they’re going to do about it, ask them what else they would be spending that 15 hours on if they didn’t have to use it staring at a spreadsheet. This understanding will allow you to build a real relationship with your prospects because they’ll feel like you get them as a person. Build the Business Case: If you sell in a known competitive environment, why not do some of the work for your prospect and build the business case for them? Most likely, they will have gone through a sales cycle for your product or service only once, whereas, you go through it 10 times a week or more. You know the common issues, you’re familiar with your competitors and their offerings, and you’ve heard your prospect’s specific challenges. Document all the requirements, show them their options, point out potential roadblocks—both with your product and your competitors—and then back up the data with reviews or client references. Taking the weight off their shoulders and providing the grading rubric can give you more influence over the deal.